Sequence was the title which immediately came to mind when the topic of downloadable titles was presented. Jason Wishnov, the man behind Iridium Studio and, in fact, the only full-time employee, deserves far better than just moderate success for this title. There are games which have staff numbering in the dozens for which the final product shows less attention to detail than Jason has paid to his creation. And one of the most important things he's done as an indie developer is learn that he can't do everything. Fortunately, he had the good fortune and savvy to contract out the portions he couldn't handle to people who could handle them very adroitly. One of the most striking things about Sequence, especially for an Xbox Live Indie Game, is the flair which is present throughout every aspect of the visuals. The backgrounds of the game are bright and vivid, brushed artwork instead of simple sprite work, and the characters themselves, represented through illustrations with only a few facial changes, demonstrate a style with muddy colors but still very distinct style. It works very well with the nature of the game, since the illustrations themselves show so much character. 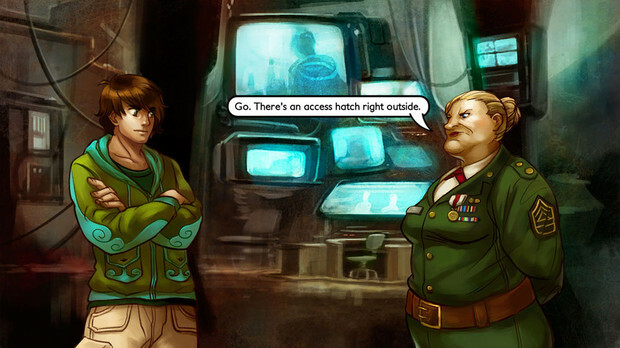 Each illustration, despite being just a single drawing, does more to give the player a sense of their character than some games manage with hundreds of lines of dialogue and a flashy 3D model. 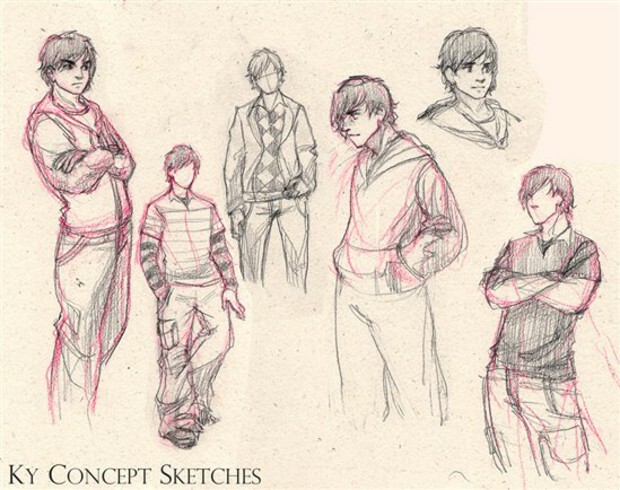 Just a quick glance at the collection of characters shows that a lot of thought was put into every aspect of the characters and backgrounds by the artist, Wendi Chen. This was a project which needed a strong, consistent artistic direction, and as an artist Wendi Chen really delivered exactly what the game required. Of course, what is a music game without music? The selection of tracks for a game which relies on them for the gameplay can utterly make or destroy a rhythm game before the first line of code is finalized. Good rhythm games need fantastic music, and this is an area where Sequence shines. All of the tracks in the game are composed by two artists, Ronald Jenkees and Michael Wade Hamilton (credited as DJ Plaeskool). They have more than delivered here. Ronald Jenkees provides most of the in-battle music, flexing his artistic prowess and delivering an astounding variety within the confines of the mostly-electronic soundtrack. Disorganized Fun is a relatively slow, yet frantic song which very much shows an electronic, techno background. He then switches pace with a stunning track which explores everything I love about electric guitars with Guitar Sound, a song which sounds like nothing more than a long guitar solo. Super Fun, an otherwise unremarkable piece of work backed by a haunting combination of strings and piano work, serves to use the classical instruments to make it a much greater piece than it has any right to be. This variety is not limited to these three songs, but extends to every piece Jenkees contributed to the game. That's not to say that Michael Wade Hamilton doesn't hold his own. While his music serves to provide tracks for mundane portions of the game like the title music and safe room, he pulls double duty providing understated music like The Snow Mistress's Allure which underscore the dramatic moments within the story, as well as contributing more heavy-hitting songs for the gameplay segments like Rapid Fire and On Cue, neither track suffering in the least for being placed beside Ronald Jenkees' work. Of course, the gameplay of anything willing to call itself a game is the most important aspect of any release, and this is another place where Sequence naturally shines. The controls are tight and the game is responsive to input. More importantly, the sheer variety of the control-types on offer will stagger you. No, not button layouts. If you want to play this game with a regular controller, you're free to do so. However, the game doesn't stop there. This game has options for Guitar controllers (Rock Band or Guitar Hero), as well as providing full support for DDR dance pads. How you play the game and enjoy it is up to you, since Iridium Games is more than willing to accommodate you. That alone has added untold replay value to the game. I've beaten it with a controller, and my next move is clearly playing this thing Rock Band-style. After that... My metal DDR pad has not seen use for many a moon, but if I set the game to easy it might be worth digging them out. Control variety aside, the game is just fun. Three different streams of descending notes head towards the player, and these form the meat of the core gameplay. One is the player's defense stream. Inputs come down and if ignored, deal a set amount of damage to the player dependant on the color. Hitting the notes successfully prevents the enemy from draining your health, which, if it hits zero, means you've lost the fight. However this is a stalling tactic at best: If you don't whittle down your enemy's health by the end of the match, you lose no matter how much higher your own HP is. The second stream is the mana stream. In the game, mana is used to cast attack spells which damage the enemy. A few very useful spells aside, you'll run out of mana before your enemy is dead, meaning you have to switch between regaining your mana and defending yourself from enemy attack. The third stream is the attack stream. Each spell has a sequence of inputs (randomized by directional input but not by rhythm) which, if entered flawlessly, causes a certain effect. Some spells heal the protagonist Ky, others reduce the amount of notes the enemy is allowed to send in the defense stream, and the majority deal damage to the enemy. More powerful spells are balanced by longer cool-down times between castings as well as higher mana costs. All three of these streams are active at all times. 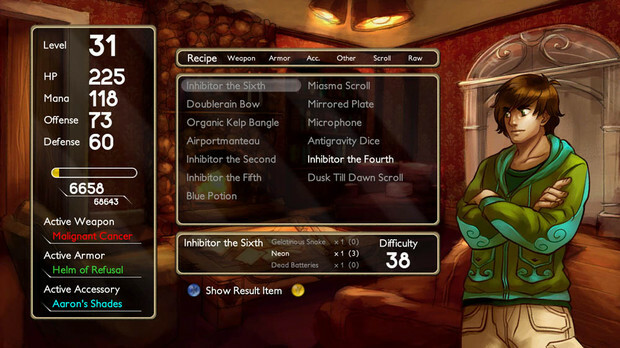 Complicating matters are the effects unique to the boss of each of the seven levels in the game, which can strike at any time during the regular battles until the player crafts a nullifying item, which protects them from random intrusions on their own battles but can still interfere in the boss fight itself. These effects range from simply blocking the player's view of inactive streams to locking the player in a specific stream, to even more dangerous alterations such as reversing inputs, which proves simple when playing on a controller but ruthlessly lethal when playing on a guitar controller. Of course, more classic DDR/Guitar Hero style gameplay is also hidden within the game in the scrolls the player must use to learn new spells. 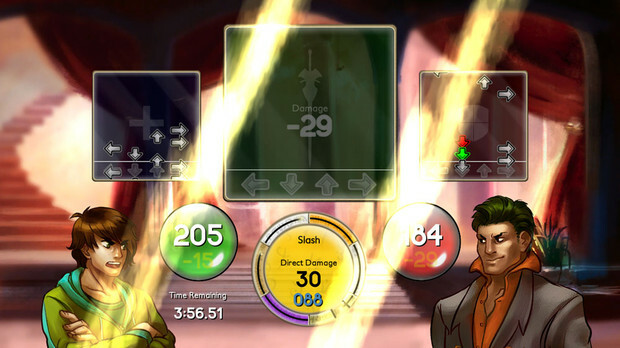 During such events the player only has a single stream of notes, scheduled to the rhythm of the song. Each spell has a specific goal, such as playing a certain number of notes consecutively or maintaining a certain percentage of inputs correctly entered throughout the duration of the song. These scroll sequences serve to switch up the pace of the game a little bit, allowing the player to try their hand at a regular rhythm game for a moment before diving back into the chaos of the main gameplay. On top of all this is the one thing which makes any genre better: light RPG mechanics. The player levels up throughout the game, acquiring new spells and stat-boosting equipment and game-changing accessories through crafting. A portion of the game is dedicated to grinding out the materials needed for key items to advance, but savvy players will also upgrade their equipment and learn new spells through the recipes given to them as they ascend each level. In a nod to the RPG elements which inspired it, the game even has a bonus boss more difficult to face than the actual final boss. Combined with the complexity of the core gameplay, Sequence crafts a genre ripe for further exploration. Despite being around ten hours of gameplay for one play through, this is a game which will leave you begging for more. The thing which impresses me the most about the game, however, is not just the gameplay itself, the music, and the visuals, but the fact that on top of all this the game is fully-voiced by professional voice actors who put in a damned good performance. It helps their work that the script Jason Wishnov wrote to accompany his game is filled with enough comedy and human touches which help the player empathize with the protagonists Ky and Naia as the story unfolds around them. It's not Shakespeare, but there are people paid more in a month than this game's entire budget who've had far worse published. The game's twists, while not entirely unpredictable, are delivered with enough subtlety and build-up that they become believable within the context of the plot. Not only is Sequence a game which has an astounding amount of production values and quality, but I think it might be the single-most overlooked and under-appreciated title of the year. It really helps that impression that this game is three dollars. I've paid twenty times that for titles which lasted half as long and were ten times less entertaining. Given the quality of this title, it would stand better as a Xbox Live Arcade than an offering from Xbox Live Indie Games. The production values are simply that good. This game is why Xbox Live Indie Games exists, and the shame of it is that most other indie devs on the service can never hope to have half the talent and dedication that a title of this scope, depth, and sheer fun requires to produce. This is not just a game, but a resume to every major developer telling them that Jason Wishnov is a man they need to hire before their competition snaps him up. If you have any interest in RPGs, rhythm games, or even something that provides a breath of fresh new air, you've done yourself a profound disservice if you managed to miss the release of Sequence thus far. This is literally the best way you can spend three dollars on gaming at the moment.